Through their strategy to make a fictional drama more compelling, the creators of Marvel's latest movie have made it harder to address the real-world problem of climate change. Truth is “the first casualty” of war. So declared historian Philip Knightley, echoing sentiments voiced as far back as ancient Greece, in his account of how nationalist fervors distorted news coverage of international conflicts, from Crimea to Vietnam. Few would expect the writers and directors of a comic-book movie to limit themselves to “the truth,” whether scientific or historical. But neither, given the movie villain’s terrible mission, would anyone expect the writers and directors of Avengers: Infinity War, AIW, to construct such a compelling, conflicted, and even sympathetic portrait of their bad guy. Nevertheless, that’s how the film, rapidly climbing the all-time list of most successful movies at the box office, claims its first casualty. By ascribing selfless motives to Thanos, AIW tacitly delivers this toxic message: environmentalism = mass murder. How could such a repugnant message drive the plot of a massive pop-culture success like AIW? By being wrapped in evocative computer-generated landscapes, by being surrounded with witty, likeable characters, and by being developed in expository scenes that alternate with hyperkinetic action sequences over the film’s two-and-one-half hour length. The result, as one reviewer has noted, is less one big film than a series of smaller stories strung together in a (mostly) logical sequence. The Avengers, for those who have never spent time in the Marvel Cinematic Universe, is the name given to the collective efforts of the individual superheroes created and developed in separate comic books and movies over the past five decades. Infinity War is the fourth time the Avengers have been brought together on screen. In the first two outings (2012 and 2015), they successfully defeated their foes. In the third, Captain America: Civil War, they again prevailed, but only after being driven by conflicts that emerged in the process. Over the course of these and the other 15 related films released since 2008, Marvel’s writers have also introduced “the Infinity Stones,” six gems created when different cosmic forces were crystalized during the Big Bang. 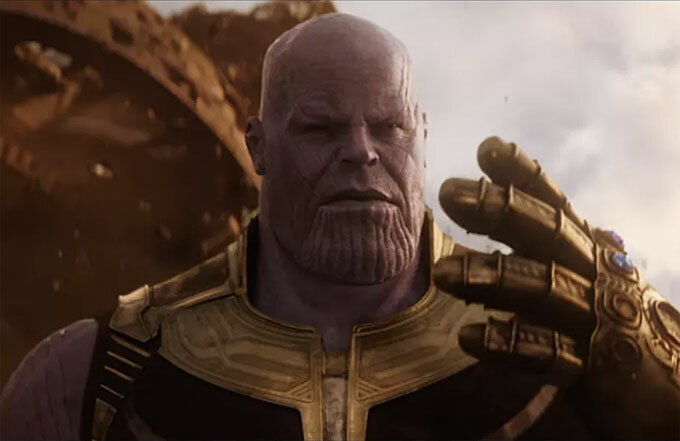 Thanos, the fearsome giant who has lurked in the background – and post-credit scenes – of several Marvel movies, seeks these stones so he can painlessly reduce the humanoid population of the universe by one half. Why? Because he has witnessed, on his own planet and elsewhere, how unrestricted population growth can exhaust or despoil available resources. But “restoring balance” one planet at a time is slow and difficult work. And so AIW tracks Thanos, across several different planets as he battles different groups of Avengers to take possession of all six infinity stones. In the film’s dark ending, half of the Avengers disintegrate when Thanos finally uses the combined powers of the stones. It is these casualties that have drawn so much excited commentary. The film itself leaves viewers with one final image of Thanos, sitting on a hillside watching a sun set over an exquisitely beautiful natural landscape. Eliminating half of all humanoids seems to have worked. Balance has been restored, nature revitalized. An as-yet-unnamed sequel is already scheduled for release in May 2019, and all the available clues indicate that some if not all of Thanos’s actions will be reversed. One compelling piece of evidence: among those departed are figures who have starring roles in Marvel films already scheduled for release in 2019, 2020, or 2021. But will Marvel reverse, or neutralize, AIW’s toxic message about environmentalism? That could happen if some character finally challenges Thanos’ formulation of the problem. In AIW, no one ever points to a country or world that has learned to live sustainably, even though at least two places in the Marvel Cinematic Universe, Asgard and Wakanda, appear to have been moving in that direction. Neither does anyone point out other ways to solve the problem of environmental degradation, or even other ways to pursue Thanos’s preferred solution. Empowering women, for example, is a peaceful way to constrain and then reverse population growth. Finally, no one points out to Thanos that suddenly reducing a population by half will more likely result in chaos than in “balance” as the economy collapses. Or that if a society somehow managed to survive the shock, its population would likely again grow past the point of sustainability – unless it chose to manage its affairs differently. Raising these questions would make Thanos’s commitment to his mission appear demented rather than selfless, the result of a monomaniacal vision of the world shaped by his power-corrupted soul. Then following their inevitable victory over Thanos – these are comic-book movies after all – the Avengers could return to the challenge of caring for the planet in a humane and equitable way. Previous Marvel movies offer reason to hope that this could happen. An early scene in the first Avengers movie, for example, highlighted the efforts of Tony Stark (Iron Man) to power his headquarters with 100 percent clean, renewable energy. Sadly, the more likely outcome is that concern for the problem will dissolve as soon as the Avengers succeed in undoing Thanos’s radical solution. This is exactly what happened in the first The Kingsman movie (2014), when Britain’s most secret special agents thwarted the population-culling plan of its much-less sympathetic villain. First the writers have the villain describe a chronic problem, population and the state of the environment, in such stark terms that extreme measures seem warranted. But those extreme measures then become the dramatically acute problem at the heart of the movie. When that problem is solved, by dispatching the villain, the original problem is forgotten. No one talks about the environment or population in the second Kingsman (2017). Why worry about any of this? Because the underlying message – environmentalism = mass murder – is not limited to the movies. This meme has circulated at different times, with varying degrees of virulence, among conservative climate dismissives. This is the meme behind the claim, circulated among members of this group some years ago, that Rachel Carson was a bigger mass murderer than Adolf Hitler. Conveniently overlooking the fact that DDT was never banned in Africa and that mosquitos developed resistance wherever DDT was used indiscriminately, opponents of environmental regulation laid the blame for every malarial death after the publication of Silent Spring on Rachel Carson’s grave. AIW revives this sort of thinking: Good people, true Americans, must band together to fight the murderous environmentalists. Conservative commentators have already responded to this aspect of AIW, welcoming “Marvel’s Conservative Turn,” decrying “overpopulation panic,” and reminding followers about economist Julian Simon’s assurance that humans are the “ultimate resource.” For these authors, Thanos’s Malthusian worldview represents “left-wing orthodoxy.” As a result, climate change communicators should expect Thanos-themed attacks on environmentalism next Earth Day, which will be celebrated just two weeks before Marvel releases its sequel to AIW. The Marvel Cinematic Universe is a rare achievement in the making and marketing of movies. In 11 years Marvel has released 19 interconnected films. From the very first Iron Man to this most recent Avengers, Marvel movies have regularly championed diversity, featuring women and people of color in strong roles that embody courage, intelligence, and humanity. Is it too much to ask that a genuine concern for the planet be included among the core values of this enterprise? Filmgoers, and climate communicators, will have to wait until next year to see whether the makers of AIW2 have the stones for this transformation.